After several weeks spent on the road interacting with poets from the Free State, Northern Cape, North West, Mpumalanga and the Eastern Cape, Badilisha Poetry X-Change is happy to be coming home with our hearts and hard drives full of poetry. The focus of the 2017/2018 edition of #BPXRoadTrip was profiling poets who specifically work in South African indigenous languages and live in the targeted provinces. However, we have decided to celebrate our homecoming by hosting a bonus recording session for Cape Town-based poets who write in Afrikaans, Xhosa, Setswana, Sepedi, Zulu, and Ndebele. 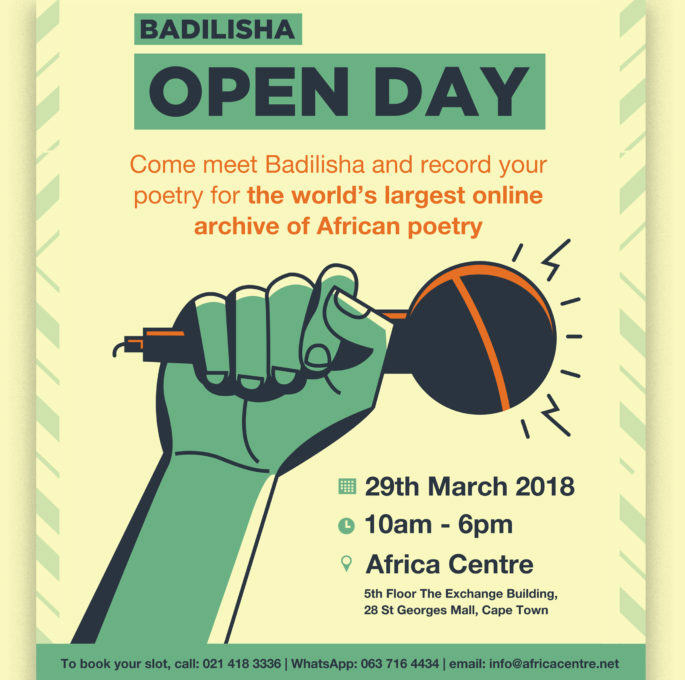 Come to the Badilisha studios, located at the Africa Centre office in Cape Town, on Thursday 29th March to meet with us, record your poetry, and give us some feedback about Badilisha and how you think we can continue to grow and improve this ground-breaking archive. The end of this road trip also marks a shift in how we manage poetry submissions. Historically, Badilisha has accepted poetry submissions all year round. This means that we continue to accept submissions even when we do not have the resources to curate and produce the poetry podcasts. The result is that we sit with poet’s submissions for months which is frustrating to poets eager for feedback on their submissions. Going forward, Badilisha will announce a call for submissions and only receive applications when the resources are available to curate and produce the podcasts. In the meantime, poets who wish to have their work reviewed for Badilisha in 2018 are encouraged to come to Badilisha Open Day and record their work with us. And while the primary focus is non-English poetry, we welcome work from exceptional English speaking poets. Bookings are encouraged but walk-ins are welcome.